Tea is a major product of Rwanda's economy, with thousands of tons exported each year. The government is slowly privatising plantations into cooperatives and 'Tea Societies', empowering local farmers. Many visitors to Rwanda will enjoy seeing the plantations with their dramatically-sloped fields and panoramic vistas. Locally-produced varieties of tea can be sampled and taken back as souvenirs from Rwanda. 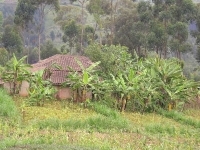 Plantations near Lake Kivu and Nyungwe Forest are especially popular as package tour excursions.